Towards Values-Based Innovation Management: In order to specify the potential of values-based innovation, we need to differentiate between various management levels and the impact of different types of values. Building on The Integrated Management Concept (building on Bleicher), we distinguish between three dimensions of management in general and innovation management in particular. These are the normative, strategic, and instrumental management dimensions. Figure: Values (left) impact normative, strategic and instrumental management and may be leveraged to inform innovation activities (right) such as innovation in values-based networks. Our framework describes how a company’s values and normative orientations — constituted of corporate governance, policy and culture, and articulated, for instance, in vision or mission statements — frame strategies and operations and thus business model-related decisions. 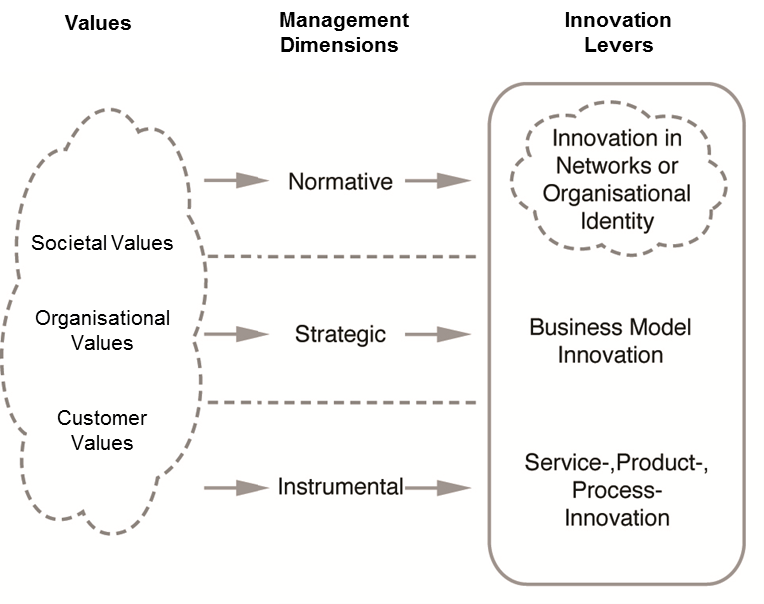 The figure above relates the three innovation management dimensions to exemplary values on the left and broad innovation categories (called “innovation levers”) associated with these dimensions on the right. A Framework and Workshop Method for Values-Based Business Modelling: In order to facilitate the ideation and development of values-based networks and business models, and thereby translate the theoretical framework described above into an actionable management approach, we combined a “future workshop” format (workshop part 1) and business modelling techniques (workshop part 2). Figure: A framework and workshop method for values-based network and business model innovation. Workshop part 1 (Future workshop): A “future workshop” consists of three phases of critique, vision (or fantasy) and realisation. This format allows directing collaborative reasoning in the critique phase towards values that are neglected or counteracted in the current situation. In the visionary phase, participants are asked, which ideal values could be achieved in a Utopian setting, i.e., in the best of all cases. They are also asked to provide live graphic recordings of emerging associations and ideas to enhance their imagination. In the realisation phase, participants generate ideas on how to realise selected aspects of their ideal values and on how the different participating actors could contribute to the realisation of these values. Workshop part 2 (Business modelling): The second workshop part shown in Fig. 3 is dedicated to business model and network development using the Business Innovation Kit. The toolkit contains self-explanatory instructions guiding workshop teams through the definition of values or a “common ground”, exemplification (through cases and business model patterns), ideation (for single business model components), modelling relations across components and models, and challenging implicit assumptions with scenarios. The layout of this tool supports values-based, and thus also sustainability-oriented, modelling in collaborative settings and accounts for the participants’ varying and potentially conflicting values and normative orientations. Breuer, H. & Lüdeke-Freund, F. (2017): Values-Based Network and Business Model Innovation, Int. Journal of Innovation Management, Vol. 21, No. 3, Art. 1750028 (35 pages).